Genki no Mori Kajika is a lodging facility. For the building itseil, an old closed school "Former Chuo Minami Elementary School"was renovated. 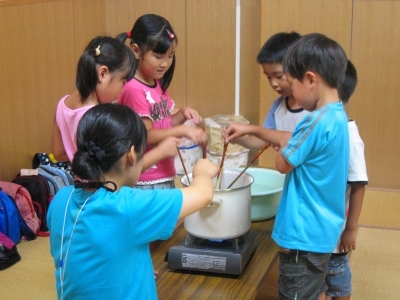 At this facility, there are programs such as "Dietary Education," where you make your own meal and snacks using local produce and learn the importance and the history of food, or "Create Your Own Program," where you can learn how to make your original stuff from local people, using natural ingredients such as leaves, bamboos and woods. This facility is also used for training camps. 25 minutes by car from Kyushu Expressway Matsubase IC or Mifune IC. 1 hour by bus from Kumamoto Kotsu Center with Kumamoto Bus and Aso Kotsu Bus. Stop at Kajika Mae Bus Stop. Make your own shopping bag or handkerchief with plant dyeing.